If you have unwanted diamond jewelry, chances are that you have asked yourself more than once about where you can get the best prices for your family heirlooms. Whereas Glendale is not the hub of buying and selling of diamond, you can rest assured that you will get genuine offer for your precious metals. All that you have to do is to give us a courtesy call or walk into one of our shops to inquire about selling your diamond. No matter what state your diamond jewelry may be in, you can bring all of them to us and we will provide you with an instant offer of cash for diamond. Unlike our competitors, we will provide you with up to seven days to ponder over our deal. It’s always been our motto to encourage customers to compare and contrast prices offered by different competitors. After all, this is the only way of ensuring that you are getting the best deal in the market. Nonetheless, in spite of the 7 days of searching and comparing prices, we are certain that you will find that we are the best diamond buyers in Glendale. Therefore, do not wait a minute longer; get instant cash for your diamonds today. A jeweler must look at the diamond in order to tell you what the actual worth is of that diamond. There are 4 considerations that we look at with diamonds. Those 4 are: the cut, the clarity, the color and the size. You can read more information to give you a general idea here. Why Should You Sell Your Diamonds to Us? Our business has been built on honesty and integrity. All our shops in Glendale and surrounding areas are fully equipped with certified scales. This in turn assures you that you are not being short-changed in terms of the number of carats that your diamond heirloom has. You will not feel the need to haggle over prices since we will have provided you with the best offer in the market. Our first offer is based on the actual value of your jewelry. We do not start low, but high when providing our customers with estimates. As pointed out earlier, we will provide you with up to 7 days to think about our offer. Once the 7 days are up, you do not have to worry about settling for a lower price since the offer will still stand. Our goal and objective is to make you a life-time customer. It is for this reason that we will urge you to compare prices and determine if we are really providing you with top dollar for your diamond. We will provide you with all the information you require in respect to buying and selling diamonds for cash. Your decision will be solely based on the info that we have provided you with. 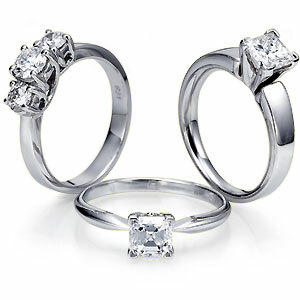 Like in the picture above, whether it be white gold or platinum piece, we will also make you an offer on the whole piece. Because we are also a jewelry store, we are also able to purchase your diamonds from you.